What do the the fall of the Berlin Wall, the height of Paula Abdul’s popularity, the creation of boy bands, and me being called into the principal’s office have in common? These all happened in 1989. Step to Success: A step to your success is anything that moves your life and your business forward. Whether it’s an app, a book or an idea, you can apply something today that will help you succeed. Today’s step are two easy hacks in Gmail that allows you to filter incoming mail. Straight from the source. Dancer’s Dialect: The Dancer’s Dialect is the dancer’s language. I share dance concepts and terminology across different genres so you can see the correlations in your life and in your business. The word in this cheap tramadol 100mg session is Dancer’s Pose used both in dance and yoga. Check out this article and video. Freestyle Flow: The saying “State of Mind, not Date of Birth” resonates with me so much that I talk about it again with a recent experience proving that you can do what you set your mind to do. 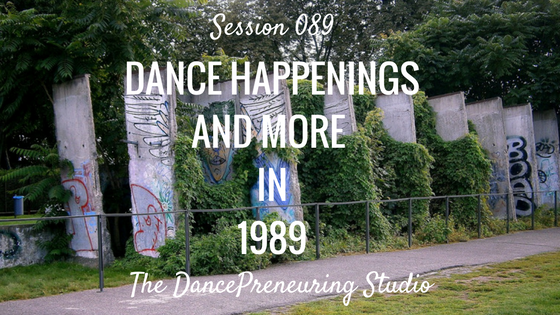 Feature Presentation: Session number 89 took me back to the year 1989 and pivotal points in history and in my life.